Paul was born in Campbellsville on August 15, 1932. He grew up in Danville, but came back to Campbellsville with his mother and step-father after his father died and has lived here since 1950. Paul’s Mother was Pauline Keltner Stanley-Etherington, his father was Richard Edward Stanley and his step-father was Bill Etherington. Paul is survived by a cousin, Maureen Rafferty of Campbellsville and special friends, Dave and Debbie Nunery and Bob and Beverly Elzy of Campbellsville and their grandson, Jackson Elzy, for whom Paul went over and above to get an autograph of Coach Cal. Paul became a Christian at an early age and, at the age of 17, became an active member of Campbellsville Baptist Church where he was active in the choir and other music programs in the church, occasionally performing as a soloist. He was also very involved in other music programs in the community including participating for 50 years in the Bethel Presbyterian Church Christian program. 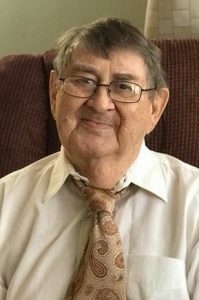 He was in the all-state chorus in high school and taught art and music appreciation at Taylor County High School for 38 years and was the first Rank 1 teacher at TCHS. Paul has honored Campbellsville Baptist Church by donating his beloved grand piano to the church before his death. Paul’s passion in life was art and music. For many summers, he was in the Lexington Singers and after retirement, he enjoyed traveling to major art museums. Paul graduated from Danville High School where he was active in music, art, debate and the band. Paul was very proud of the fact that he graduated from the University of Kentucky three times, earning a Bachelor degree in 1960, a Master’s Degree in 1961 and his Rank 1 degree in 1971. Paul was an active fan in the Big Blue Nation and rarely missed watching a UK basketball game until his passing. He received many honors and awards in high school and at UK. In his Sunday School Class and at the Class’s annual Christmas parties, Paul loved to entertain by playing the piano and presenting humorous monologues about his fellow classmates. At the Christmas parties, he never failed to bring his much loved hot-brown casserole. Paul was a much-loved and unique individual who brought joy to many by sharing his talents whenever he could. He will be missed by all those who knew him and loved him.